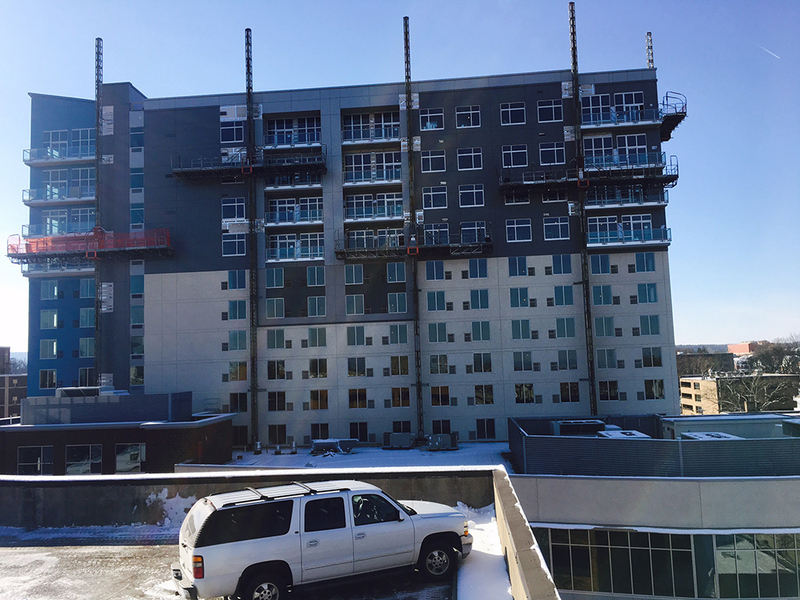 This February, we were lucky enough to be working in downtown State College, Pennsylvania on the Fraser Centre, a prominent new retail, hotel and residential development. Located in the heart of the largest borough in Pennsylvania, and just a stone’s throw from Penn State University, this important development is setto have a lasting legacy. Contractors Leonard S. Fiore Inc. came to us with a challenge, but it was a challenge we were more than happy to accept, and rise to. In all, we shipped out 16 Fraco ACT 8 mastclimbers onto the site. For this project, the electric, rather than the gas, version of the machine was a more suitable solution, and we quickly had men and materials traversing the façade of the building. We also installed a special stand on to a low roof allowing workers to finish building and waterproofing the roof whilst work continued above. “We love working on projects of this size and scope,” said Mastclimbers LLC’s Bobby Reese. What a great way to start the year, working on a fantastic project on one of Atlanta’s foremost apartments blocks and under an hour away from the office, that’s enough to wash away the post-Holiday blues. Located on one of Buckhead’s most prestigious streets, Peachtree Road - now you can’t get more Georgia than that, Atlanta Plaza was the city’s first high-rise condominium and with this historic claim comes the need to show the building a great deal of respect. So when we were asked by local construction company Engineered Restorations Inc. to get involved with the project, we knew just how to fulfil their requirements. Situated over 22 floors, the Atlanta Plaza is far from a giant when compared to some of the city’s other vast high -rises - it’s under half the height of the city’s 55 story Bank of America building. All the same, with extensive works needed on the buildings exterior, a reasonably sized machine was needed for the job. In the end, we recommended a Twin Hek MSHF mastclimber, one of our regular duty rental machines and perfect for the client’s needs. It was a job well done and everybody involved was happy to see this iconic building looking its best once more. Thankfully this was just a minor spruce up. Back in 2015, Engineered Restorations gave the building a major facelift carrying out significant works on the façade. This high-level of restoration and renovation, which included extensive works on the building’s balconies and exposed steel work, brought this well-loved apartment complex right up to date. estimated that over 37,000 square ft of system scaffolding would need to be installed. As an alternative, Mastclimbers LLC was draughted in to cut labour costs and increase efficiency. We supplied McCarthy with six 100 ft tall and 400 lineal ft Fraco ACT-8s, complete with FRH 2500 crane attachments, a Geda single car hoist, and a handful of aluminium ultra-lite free standing mastclimbers for the small footprint work on the roof. 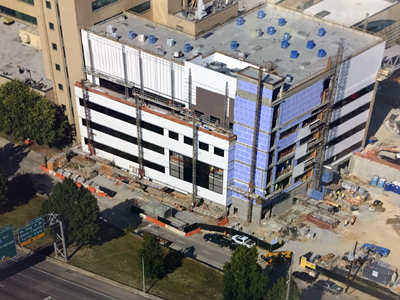 With limited barricaded space, and an aggressive schedule, Mastclimbers LLC was able to provide 90 per cent of the access to this high-profile renovation project at the busiest hospital in Atlanta. Mastclimbers LLC was the first IPAF training centre in North America and issues more PAL cards than anyone in the world for MCWPs. The Grady intensive care wing renovation project was unique for our training facility because it heralded the introduction of MCWP pre-con training for mangers, something we offer all CMs and GCs on projects we supply mastclimbers and training to. superintendents, project managers and safety managers, to verify our training. We were keen to tell them everything we know about mastclimbers, so they will know what to look for when the trades people use our machines. It’s what you’d call a was a ‘win-win’ situation. It went so well in fact, that we have made it standard operating procedure with all our clients. We think it will save lives, drive schedule, increase profit margins, and get our rentals back to us in better condition. Since some sub-contractors can be reluctant to pay for training, or think they already know everything, and because we can’t be on site 24-7 to make sure workers are safe, and our machines are being taken care of, we partner with GCs, CMs, and onsite supervisors to drive safety training, schedules, and profitability. The relationships we are forming from this the innovative strategy has resulted in repeat invitations to multiple job sites. M-Residences down in Nashville, Tennessee. This epic high-rise is the brainchild of The Preston Partnership and follows on from another successful build in the city of Adelicia, right next to Music Row in Nashville. 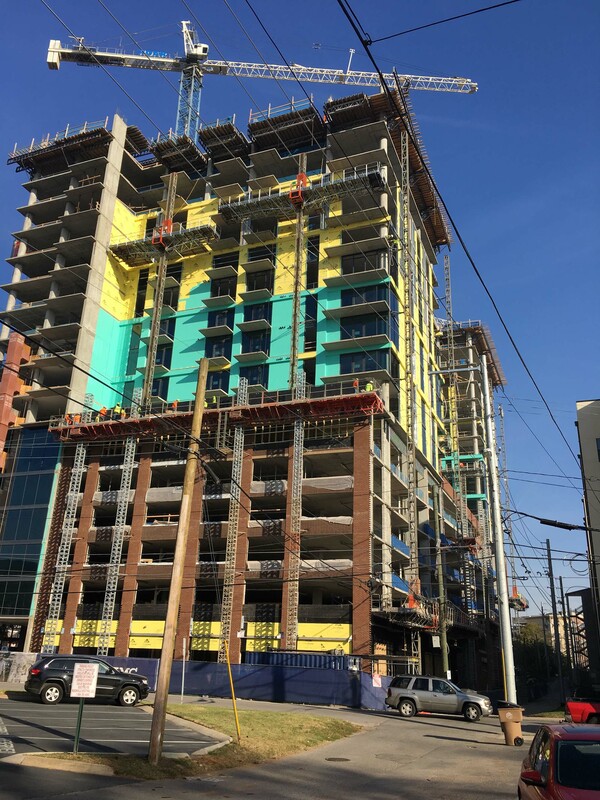 At 19-stories high, this impressive development will eventually house 332 apartments overlooking historic downtown Nashville along with a rooftop lounge bar and 9000 square feet of dining and retail space below. For our part we provided no less than 16 Fraco ACT 8 Electric mastclimbers, quite the fleet. The machines were spaced out across the site providing 100 per cent coverage around the building. 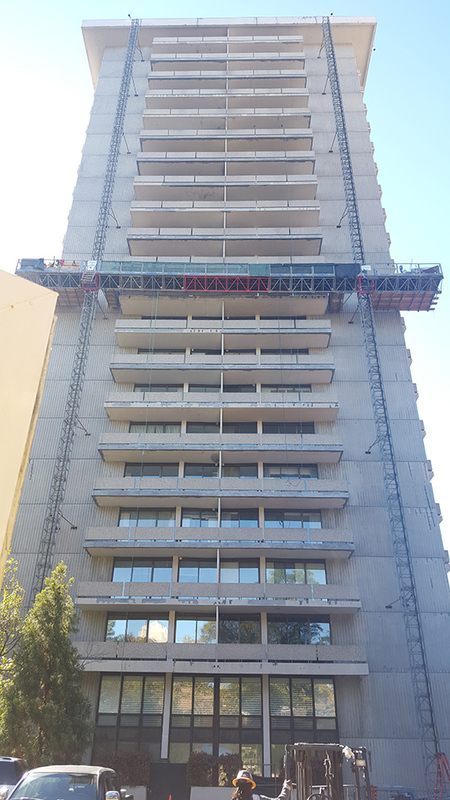 With 12 mastclimbers installed at the seventh floor podium, requiring two floors of shoring beneath each one, four of the units were installed at grade level. As there was still work going on above, all units came with overhead protection, safety will always be our number one priority. privilege for the Mastclimbers LLC team to be involved with one of the many large construction projects taking place as Nashville continues its upwards trajectory to economic success. realizing M-Residences, “Everything is working great,” he said. “We have built a good working relationship with the Mastclimbers LLC team and the job is moving forward well.